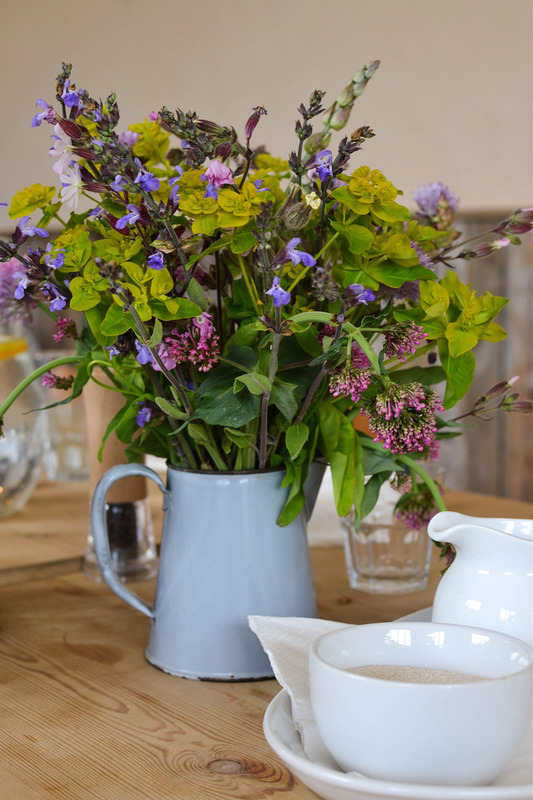 The Riverford Field Kitchen has been on my ‘must visit’ list for some time. 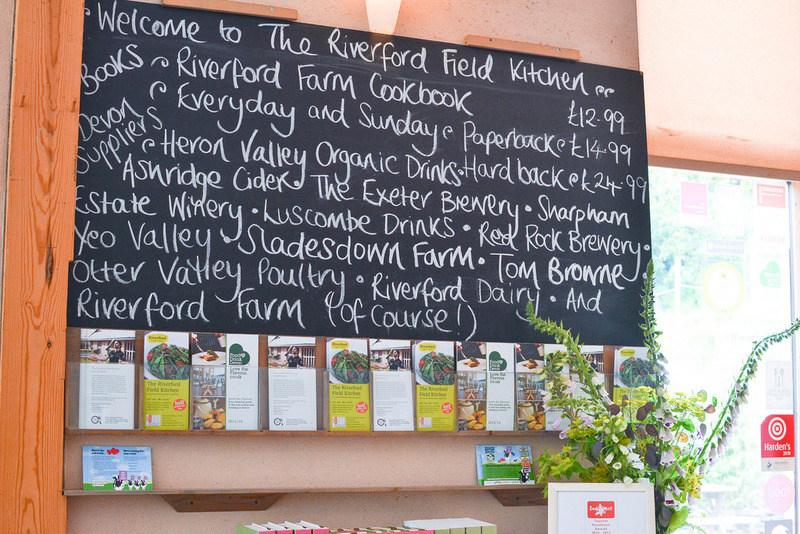 It’s set within the beautiful grounds of Riverford farm and visitor centre in Devon – a pretty idyllic place to eat and while away the hours. 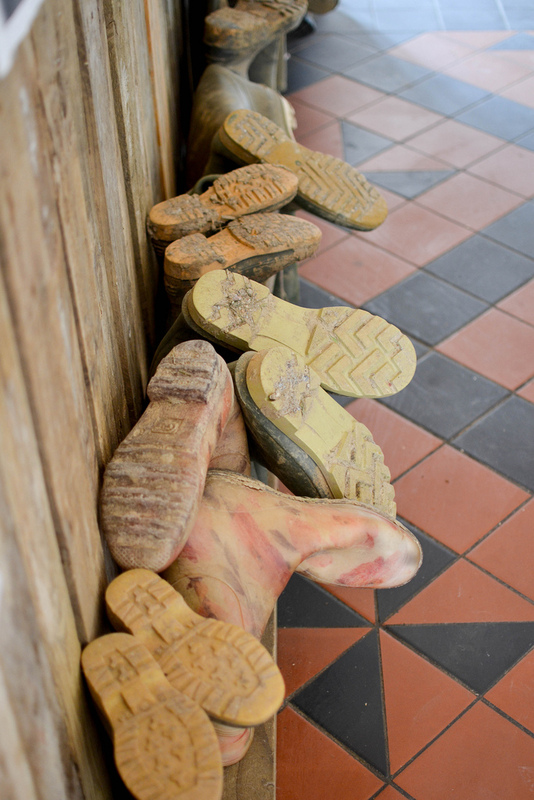 It was a glorious summer’s day when I visited but I rather liked the idea of this welly rack in the doorway. It was instantly welcoming in a rustic ‘I’m-having-lunch-on-a-farm’ kinda way. 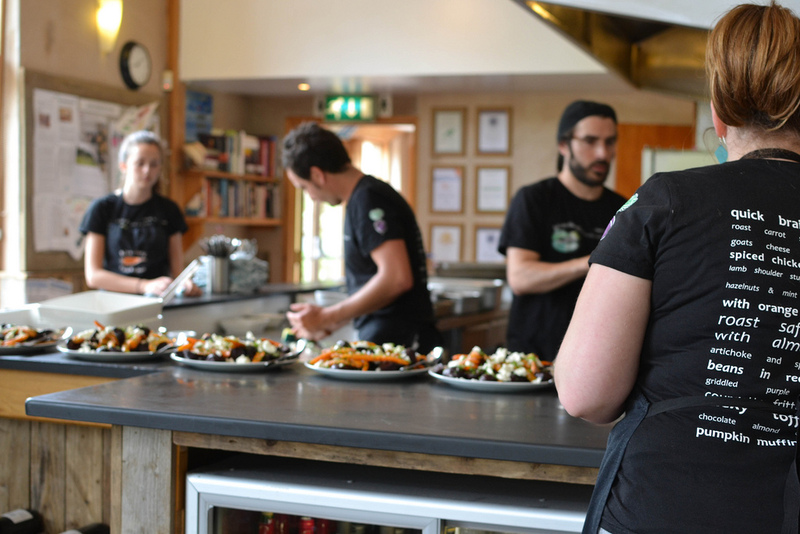 The menu is completely based on the seasonal produce grown and available locally. There is a single sitting at lunchtime and then another in the evening. I would therefore recommend that you reserve well in advance. 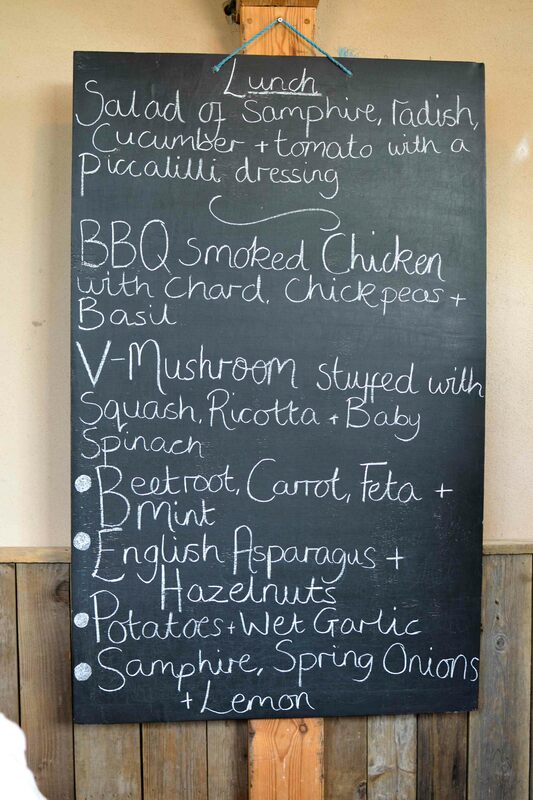 The blackboard at the entrance gives a nice overview of the producers and farmers that have grown the produce being used for lunch. The restaurant is set in a large barn with an open kitchen. For me the smells and sights of food being prepared are as much a part of a wonderful dining experience as the food so I loved watching the chefs bustle around preparing and plating up bowls for sharing. 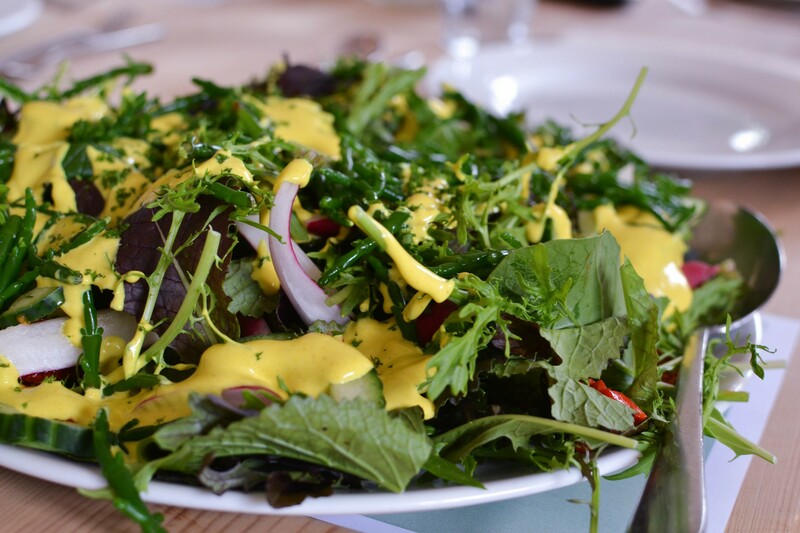 The first dish to come to our table was a simple Salad of Samphire, Radish, Cucumber and Tomato with a Piccalilli Dressing. I must admit that I wasn’t sure about the dressing not being much of a piccalilli fan but it’s tangy flavour was a perfect match for the salty samphire. 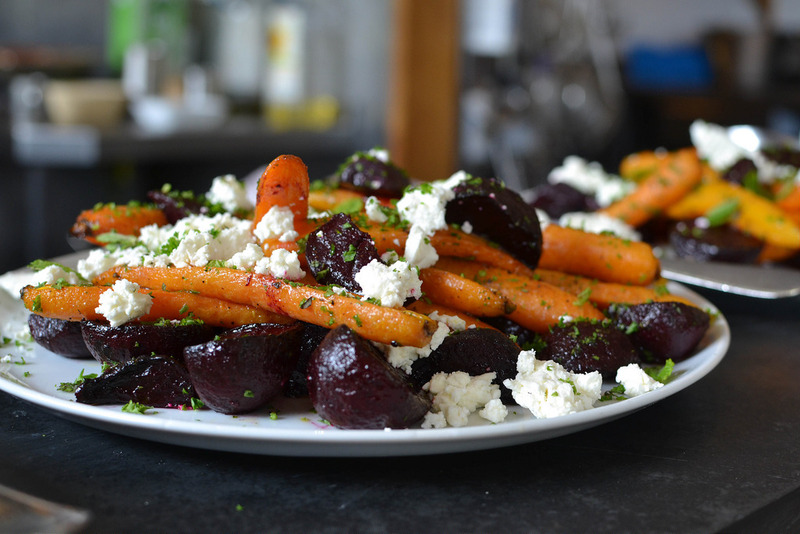 There was also a Beetroot, Carrot, Feta and Mint Salad which was lightly coated in olive oil. Both disappeared in a flash of cutlery and were mopped up with Sourdough. There was a main course of chicken which my girls loved and wolfed down. 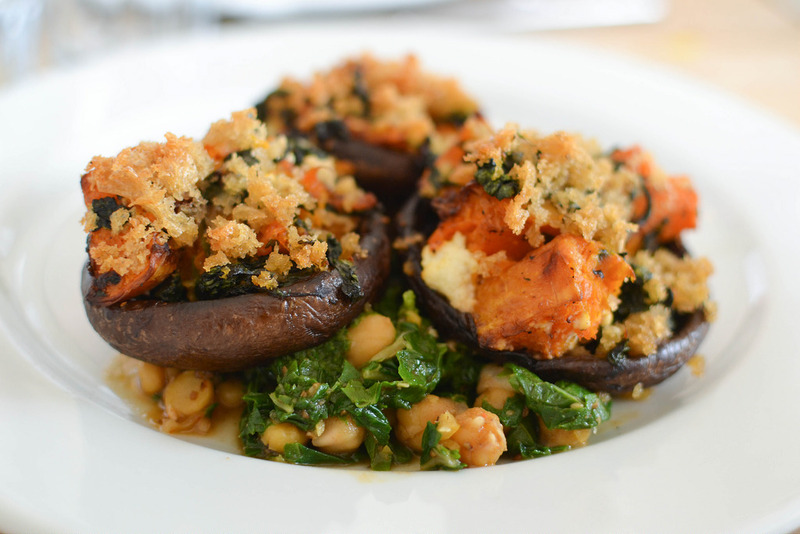 I had the ample vegetarian option of Mushrooms Stuffed With Squash, Ricotta and Baby Spinach. This was all accompanied by the most heavenly, buttery potatoes which had been steamed in a bag with wet garlic…. 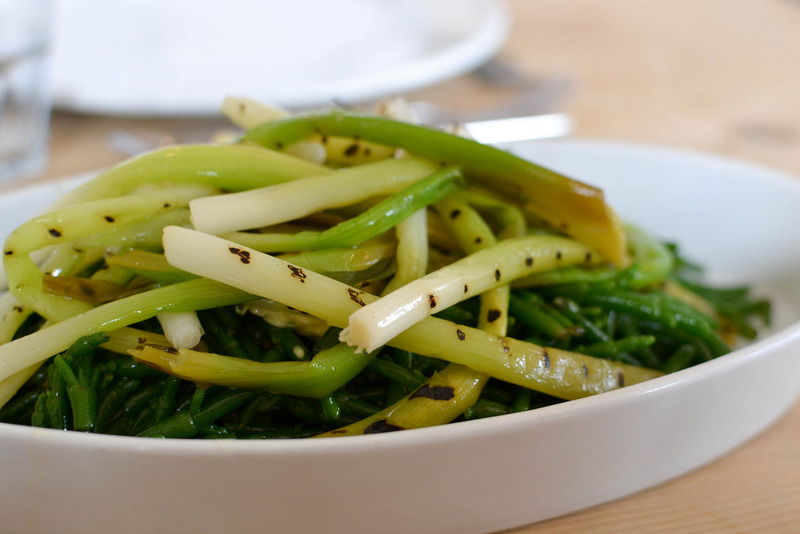 …and finally some steamed Samphire and Spring Onions bathed in lemon juice. 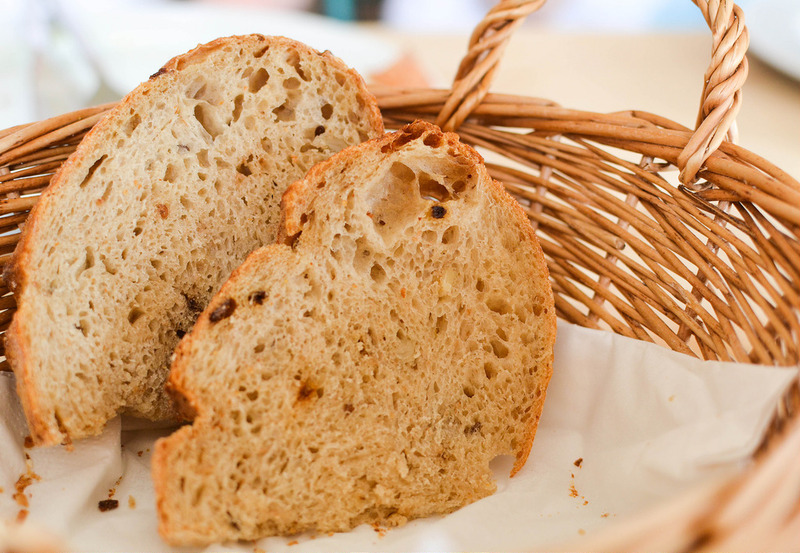 We were seated at a large wooden bench so it was a convivial atmosphere with much passing of platters and sharing of bread. 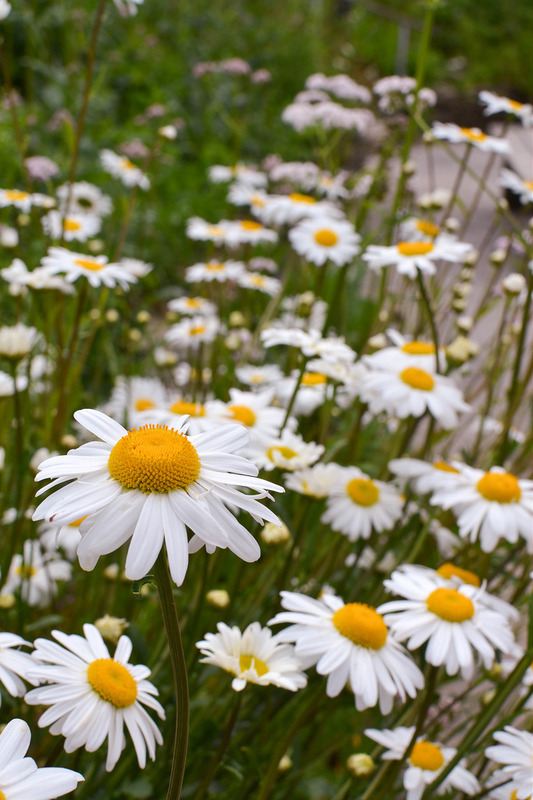 I felt I was eating at a family garden party, especially as the plates were cleared and the summer flowers on the table became visible again. Dessert was difficult. I wanted to eat all the options on offer. There were no single portioned items. 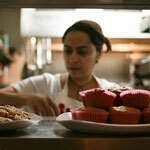 You simply went to the counter as you were ready and the chef dolloped your selection elegantly onto a plate. I chose a slide of this magnificent Custard Tart with Roasted Rhubarb on the side. 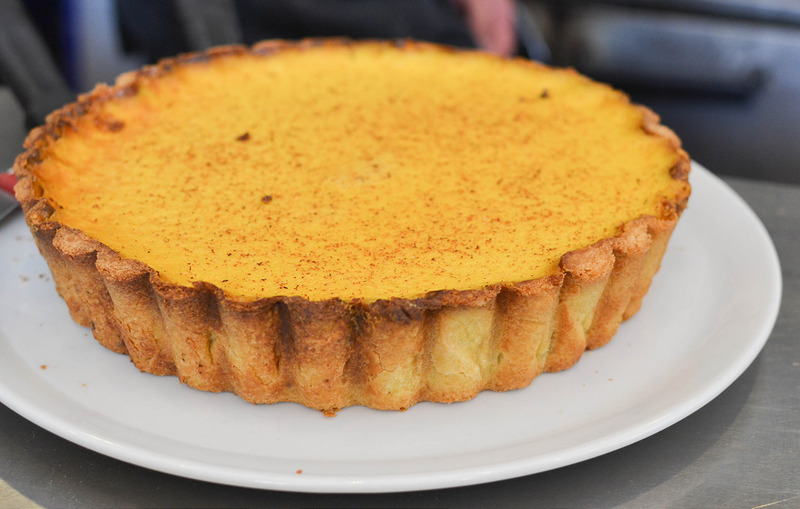 It was quite possibly the best custard tart I have ever eaten. 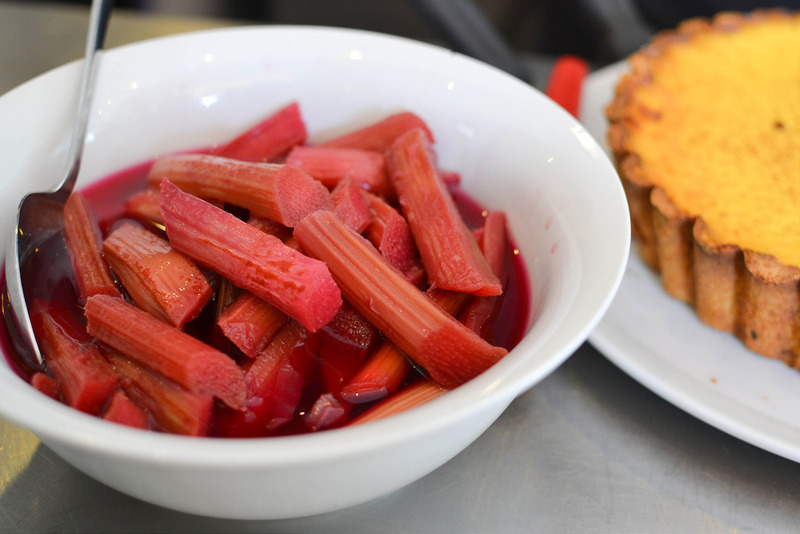 A crisp and thick pastry with a rich, velvety filling that lingered with nutmeg until I took a mouthful of the tart rhubarb. 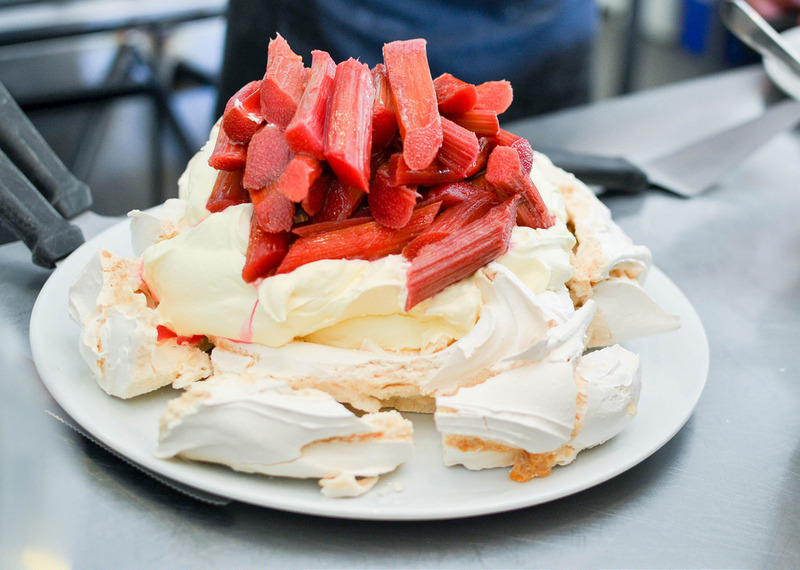 My meringue obsessed children opted for this Pavlova with Rhubarb. 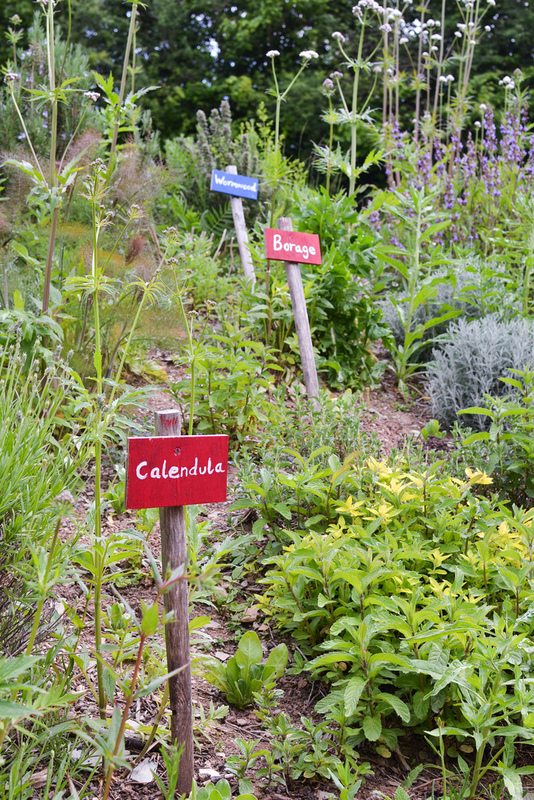 After such a hearty lunch, we took a stroll around the herb garden. It’s very clearly signposted so you can see the herbs and no-one seemed to mind us breaking off a tiny leaf to have an educational sniff and taste. I started to feel rather sleepy and may have dozed off on the grass as my girls played. 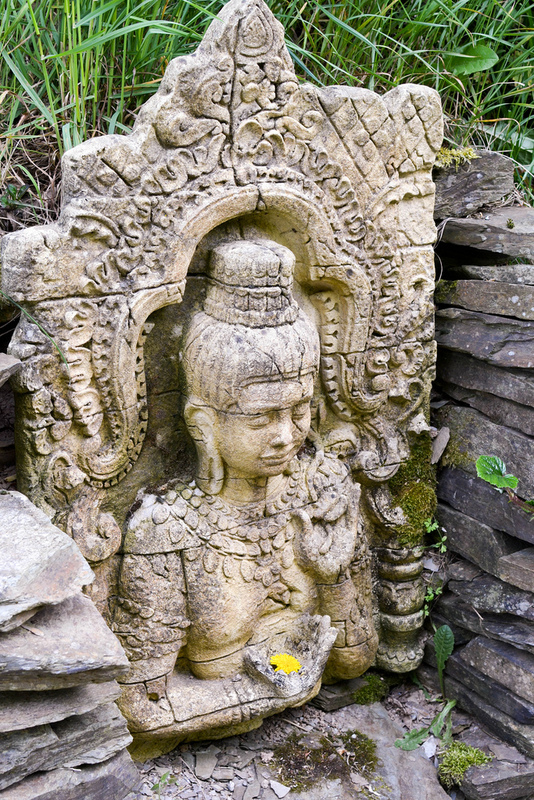 We felt a perfect sense of calm as we walked back to our car. Calm and full of great tasting memories. 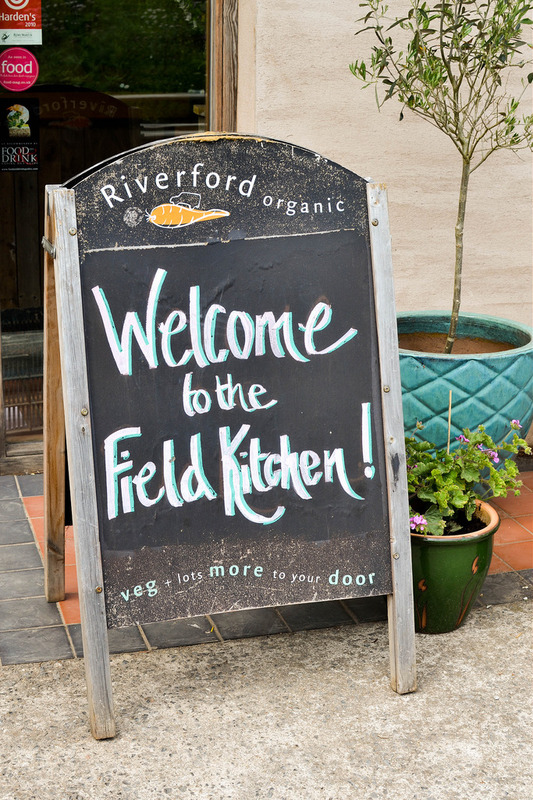 The Riverford Field Kitchen is at Wash Farm near Buckleigh. It’s open everyday for lunch at 1pm and supper on some selected evenings at 8pm. Call 01803 762074 to book. Thank you to Guy Watson and his team for welcoming us for lunch and the wonderful education of samphire. We look forward to visiting again. Only managed to get the once (live in Yorkshire) but it was wonderful. Have had a veg and fruit box for many years and they are always excellent. Farming is hard work. Organic farming is hard work, dedication and belief ! Looks completely wonderful, would love to visit next time we’re in Devon. The food looks as if they really do justice to all that lovely, organic veg and I’d love to see the herb garden too. Ooh, that sounds like a wonderful outing, Urvashi. All of those photos are having me drooling. 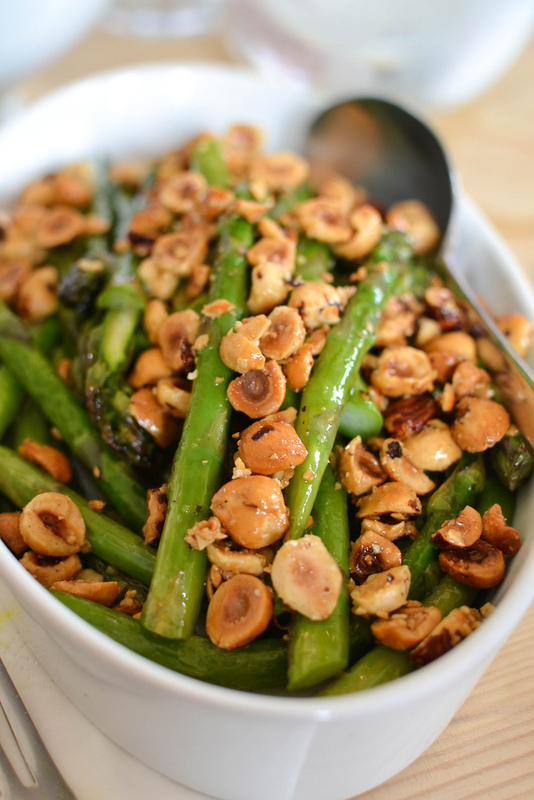 I love the sound of everything you ate – including the piccalilli dressing (how can you not like piccalilli??). I am a fan of everything Riverford but I doubt I can make the trip from up here in Scotland, so your review will have to suffice. I know. It’s a long way to go. Hopefully they will do pop ups! Thank you. It’s def worth planning a trip. They have lots going on. 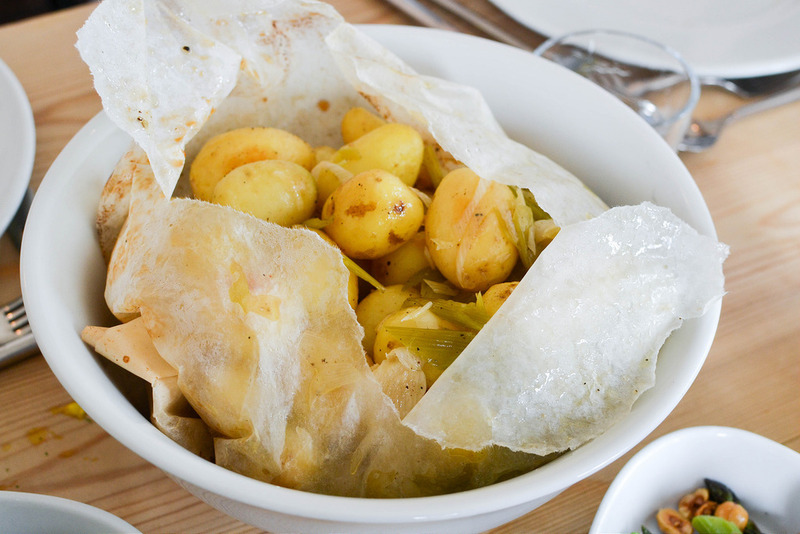 That sounds like a lunch worth travelling for – I’ll need to come up with an excuse to visit Devon again soon. The carrot and beetroot salad looks fabulous, a great mix of colour as well as flavour.